April 11, 2019 at 7:48 am. Pedro Avila, who has made one career start above Single-A, will get the call for the San Diego Padres on Thursday when they begin a four-game series against the Arizona Diamondbacks in Phoenix. The Padres are looking for a spot starter after deciding to give Chris Paddack an extra day of rest and pushing him back to Friday. Avila, a 22-year-old right-hander from Venezuela, appeared in four spring training games for San Diego, posting a 2.70 ERA in 10 innings before being sent to the Double-A Amarillo Sod Poodles to start the season. He had a no-decision in one start, allowing one run and two hits in six innings. “He’s got four pitches he can work with,” Padres manager Andy Green said, according to the the San Diego Union-Tribune. Avila will be the third Padres starter to make his major league debut this season, joining Paddack and Nick Margevicius, who pitched six innings of one-run ball Wednesday in a 3-1 win at the San Francisco Giants. Rookie reliever Robbie Erlin is expected to be optioned to Triple-A El Paso to make room for Avila. Arizona will counter with right-hander Zack Godley, who is 1-1 with a 6.55 ERA spanning 11 innings. He has struck out eight and walked five. Most of the damage to his stat line came in his first start against the Los Angeles Dodgers — eight runs, seven earned — before he bounced back by quieting the Boston Red Sox with three hits and one run in 5 2/3 innings. Arizona is 3-2 on its nine-game homestand after splitting a two-game series with the Texas Rangers, who won 5-2 on Wednesday night. Manager Torey Lovullo will be looking for more from his bullpen, which gave up four runs and six hits Wednesday night after Robbie Ray went into the sixth with a no-hitter. The manager did like how his team rallied with one run in the ninth and had the bases loaded before David Peralta’s line drive down the line was snagged by first baseman Logan Forsythe. The Diamondbacks and Padres played a three-game series in San Diego from April 1-3, with Arizona winning twice. Peralta went 8-for-14 in the series. 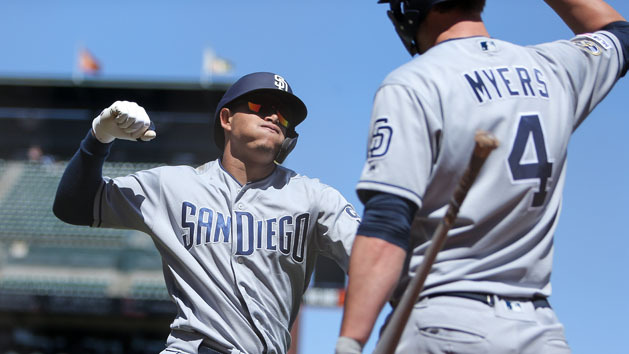 San Diego’s 20-year-old rookie shortstop Fernando Tatis Jr. was out of the lineup Wednesday as a day of rest after hitting .214 with three home runs in 42 at-bats across 12 games. Third baseman Manny Machado, the team’s $300 million free agent acquisition, is hitting .244 with three homers, including an opposite field shot at San Francisco’s Oracle Park on Wednesday.